China’s vice-president and right-hand man to Xi Jinping is known as “China’s firefighter” and is playing a key role. During a forum in Singapore organised by Michael Bloomberg this month, the former New York mayor flatteringly ­– but not entirely factually – introduced China’s Vice-President Wang Qishan, as “the most influential political figure” in China and the world. Being the right-hand man serving the all-powerful President Xi Jinping, Wang, 70, naturally sensed the political bombshell laid by Bloomberg. As soon as he took the stage, Wang went off-script and lectured the hall of prominent figures with an impromptu sharing about humility. “When I hear good things (said about me), I'd worry if it’s peng sha,” he said, referring to a Chinese expression which signifies praising someone in order to destroy them. Wang went on: “If I hear bad things, well, that’s fine, because that’s bang sha,” which means destroying someone through criticism. Setting the record straight has rarely been more important for Chinese politicians than under the current political climate. Wang gave a speech about Sino-US trade relations on the same day as Xi kept himself home and delivered opening remarks to a rather domestic audience. Wang, though, is no ordinary Chinese politician. His powerful father-in-law, Yao Yilin, was one of the senior cadres responsible for ordering the tanks into Tiananmen Square in 1989. Marrying Yao’s daughter elevated Wang to the status of “princeling”, a crucial factor in many Chinese officials’ rise, including Xi himself. But Wang is no ordinary princeling either. Rising through tough and influential positions, Wang’s resume is incomparably enviable and successful. With his work efficiency widely recognised by successive leaderships, he enjoys the title “China’s firefighter”. After two decades working on economics and finance, Wang’s shot to prominence came in 2003, when he was parachuted into the role of Beijing mayor at a time when the Chinese capital was engulfed in the outbreak of SARS virus. As was expected of the job holder, Wang joined the central government leadership, the Politburo, in 2007. An avid historian [who] enjoys philosophical debates and has a wicked sense of humour. Wang has often been Beijing’s point-man in tricky negotiations with Europe and the US, and he tells people that his favourite television show is House of Cards, the intrigue-laden US political drama starring Kevin Spacey. After he became Xi’s anti-corruption-in-chief in 2012, Wang “recommended” that all his colleagues at the top of the Communist party read Alexis de Tocqueville’s classic Ancien Regime and the French Revolution, leading observers to speculate Wang’s growing fear of a revolution in the world’s last standing major Communist nation, amid the aftermaths of the Arab Spring that toppled a few dictatorships not long ago. As secretary of the Communist Party’s Central Commission for Discipline Inspection, he spearheaded the case against former security tsar Zhou Yongkang, widely considered to be the highest-level prosecution since the fall of the Gang of Four in 1976, where Mao’s wife, Jiang Qing, was part of the persecuted. We will let the public see and enjoy our achievement fighting corruption. The strength of our anti-corruption efforts will not be lessened. Wang’s role in leading the anti-corruption drive consolidated the trust on him by Xi, whose first term as Chinese leader was accompanied by Vice President Li Yuanchao, a powerless figurehead with little achievement. But how high is Wang’s ranking in China’s political system? Unlike the US system, where the vice-president is the country’s second-highest executive office, Wang is only the eighth ranking member in the Communist Party, preceded by the seven-strong Politburo standing committee headed by Xi. 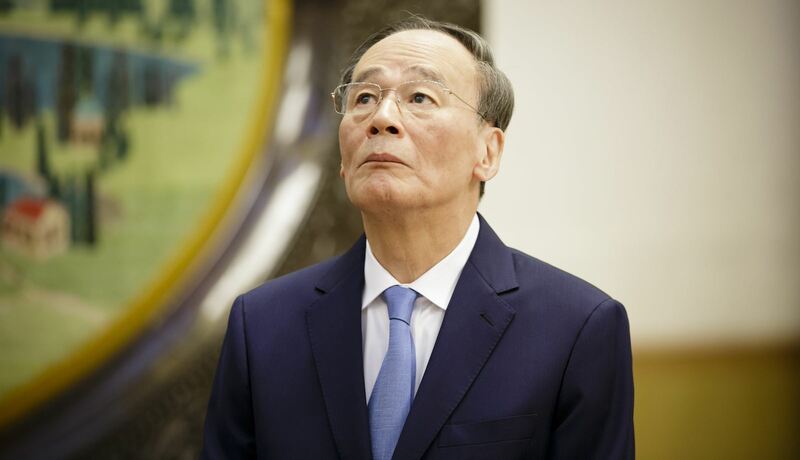 The appointment of Wang, now 70, as vice-president, defied unwritten retirement age of 68. Still, Wang also retained a seat on the standing committee, according to reports, although he no longer had the voting right as he did in the previous five years. Since he became vice-president, Wang has kept a rather busy diplomatic calendar, starting by meeting visiting foreign officials and businesspeople in Beijing. He was already meeting foreign dignitaries before assuming the vice-presidency, including a secret meeting with Steve Bannon, shortly after Bannon left the White House as chief strategist. Since then, he received Singapore’s Prime Minister Lee Hsien Loong, former Obama’s chief of staff Rahm Emanuel, Tesla boss Elon Musk, and former US secretary of state Henry Kissinger. His overseas trips are well calculated. Like Xi’s inaugural visit, Wang made Russia his first vice-presidential destination, in which he attended the St Petersburg International Economic Forum in May. Charm offensive aside, Wang’s choice of Middle East as his second trip sends a clear signal to the US: that China is ready to build new friendships at the expense of America’s long-standing interest in the region, currently represented by Trump’s own son-in-law, Jared Kushner. His Singapore trip, though, sent the most direct message lest Washington remain in doubt about his role: Wang gave a speech about Sino-US trade relations on the same day as Xi kept himself home and delivered opening remarks at the first Import Expo to a rather domestic audience. Is the apprentice ready for the firefighter-in-chief?